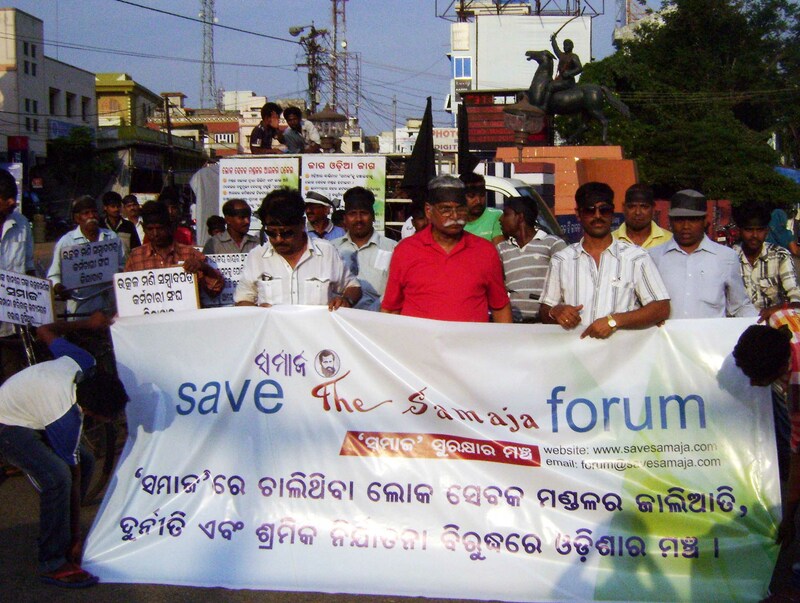 Save The Samaja Forum (SSF), spearheading a principled campaign against the fraud and felonies of Servants of the People Society, which, having illegally captured the premiere newspaper of the State is ruining it, held a significant cycle rally with black flags and black badges that covered whole of the city of Cuttack on June 07, 2013 in the afternoon, highlighting the necessity of mass action for saving the Samaja from the network of corruption, misappropriation, malpractice and exploitation of labor. Led by joint conveners of the Forum Sri Prasanta Patnaik and Sri Subhas Chandra Pattanayak and the President of Utkalmani Newspaper Employees Association (UNEA) Sri Devi Prasanna Nayak, the rally commenced from the Netaji statue in the College sqr of Cuttack, the birthplace of Netaji Subhas and covered the entire city by touching all its central nerve centers. When the rally reached the Samaja office area, it was witnessed by the unholy occupiers of the paper and photographed by them. 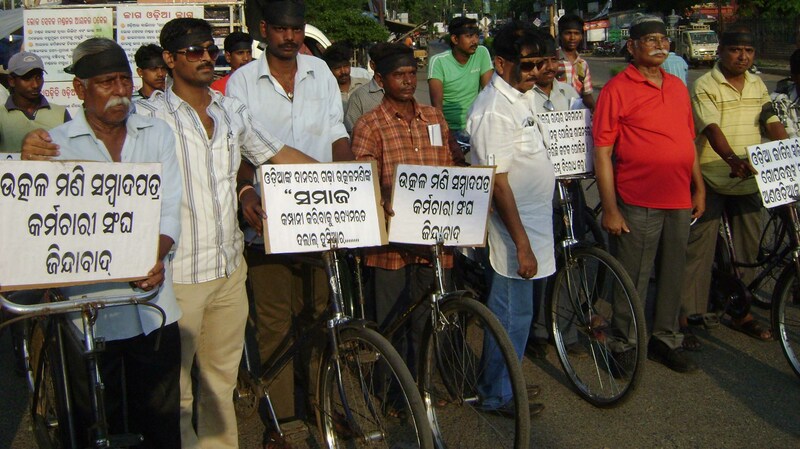 There was massive distribution of speaking leaflets elaborating the purpose of the rally, which the agents of the Samaja hijackers were seen collecting. But ethics of journalism has become such an anathema to conduct of the paper now, that it has preferred to blackout the rally. The cycle rally under black flag was the first of its kind the City has ever witnessed. It was a very effective attempt to make people aware of how the paper they have built up has been hurled into the hell by its illegal occupiers. The rally was silent as per the method of Sri Subhas Chandra Pattanayak. 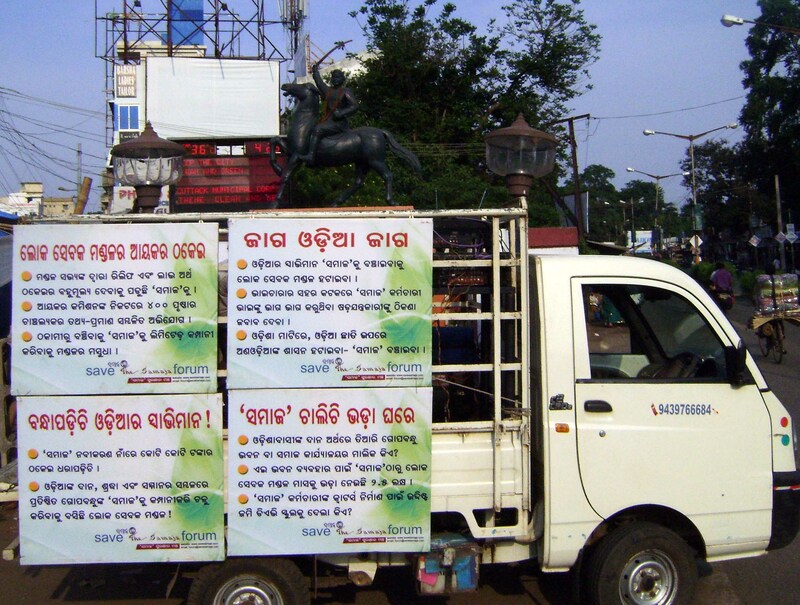 But, it was pre-fortified with appropriate slogans ranting the air, even as a pre-recorded audio CD was transmitting the message of SSF from the accompanying Sankalpa Rath, the vehicle, equipped to carry the messages to every nook and corner of Orissa to involve the people with the pledge (Sankalpa) to save the Samaja, which is their own paper built up with their financial contributions and readership support, around half an hour before its commencement to make the people aware of this unique march. The Whole City Cycle Rally starting at 4 pm from the College sqr, ended at Dolamundai sqr after involving the general public with the campaign at important nerve centres of the city. Joint conveners of SSF, Prasanta Patnaik and Subhas Chandra Pattanayak addressed the people at the ending point after an introductory speech by Sharanaravinda Ojha. Both of them called upon the Government to ensure that the ADM of Cuttack expedite his investigation into SSF allegations that the Servants of the People Society has occupied the Samaja by forging a WILL of Pt. Gopabandhu Das. The Registrar of Newspapers for Orissa was moved by the SSF to quash the false ownership of the Samaja and to take legal action against the miscreants who have been wrongfully posing as owners of the paper. On receipt of this communication from SSF, the RNI has asked the Cuttack ADM to investigate and report. But the ADM has yet to show promptness in the investigation. So the SSF leaders stressed upon expeditious investigation in this matter. They also stressed upon the urgent need of action against the financial bungling going on in the Samaja, as unveiled by an Inquiry Committee headed by Justice Arijit Pasayat, despite the same being a captive committee of the organization. They asked the government to look into why the police have not taken any action on well documented information of swindling of the funds of the Samaja by corrupt members of SoPS despite direction of the Orissa High Court in this regard, whereas, the same police officials have framed up the leaders of the Samaja employees in false cases as their trade union activities disadvantaged the very same gang against who well documented FIRs are gathering dusts in the Police Station. They condemned the management of the Samaja for contravention of labor laws and extermination of work environment in the Samaja and call upon the labor department to initiate and expedite action against the management for unfair labor practices. Editor of Janatantra Vivekanand Dash came down heavily upon the corrupt fellows that are, in the name of SoPS, busy in all sort of nefarious activities. He called upon the people of Orissa and the State government to wake up for saving the Samaja from the illegal capture of the Manubhai Patel and his gang. President of UNEA Sri Nayak placed before the public the story of the labor side and focused on how they have been subjected to false cases for their demand for regularisation of employment of persons who for decades have been working in the newspaper without any scope for the welfare schemes created by law for the employees. This inhuman practice needs be foiled, he said while expressing gratitude to SSF for its contributions to the cause of the workers. Pabitra Maharatha coordinated the event. The Samaj is not only the newspaper alone but is an icon engraved in the minds and souls of people of Orissa irrespective of whereever they reside. The few persons who have occupied the premises of The Samaj are enemies of free and frank journalism. I support the protesters who took out cycle rally.